A seven-year-old girl puts a nail-gun to her grandmother’s neck and fires. An isolated incident, say the experts. The experts are wrong. Across the world, children are killing their families. Is violence contagious? As chilling murders by children grip the country, anthropologist Hesketh Lock has his own mystery to solve: a bizarre scandal in the Taiwan timber industry. He has never been good at relationships. Asperger’s Syndrome has seen to that. But he does have a talent for spotting behavioural patterns, and an outsider’s fascination with group dynamics. Nothing obvious connects Hesketh’s Southeast Asian case with the atrocities back home. Or with the increasingly odd behaviour of his beloved step-son, Freddy. But when his Taiwan contact dies shockingly, and more acts of sabotage and child violence sweep the globe, Hesketh is forced to make connections that defy the rational principles on which he has staked his life, his career and – most devastatingly of all – his role as a father. I wasn’t at all convinced by this book when I first started it. The summary was so dynamic and shocking sounding that I expected to be thrown straight into child-killer horror early on. I think because I was expecting fireworks, I was a bit frustrated when it became clear that the story was going to take its time warming up but, as with so many slow-burners, I appreciated it by the end. The characters are given time to slowly make links between seemingly unrelated tragedies and the gradual deterioration of culture, morals and society ultimately felt much more sinister than a huge IMPLOSION followed by lots of scrabbling around can feel. The initial chapters see Hesketh going about his random-sounding day job and investigating apparent acts of sabotage within businesses, interspersed with news reports of killer kids. It felt quite disconnected, even though there were hints that something was tying everything together. When Hesketh and Professor Whybray start to make connections between the incidents, the pace cranks up to a satisfying level. It’s never quite edge-of-the-seat stuff but it does manage to be captivating, letting the more science-fiction-y elements shine through. Because Hesketh has Asperger’s Syndrome, he is mostly quite a detached narrator and removes a lot of the sensationalism from even the more grim incidents of mass juvenile violence. His love of behavioural patterns and logic gives the story a clinical edge that I mostly found intriguing, even though it does make the story difficult to connect to at times. I wanted to get behind Hesketh and Freddy but it wasn’t easy and I almost always felt one step removed. There are some moments where Hesketh’s attachment to Freddy dragged me in but overall, it was a strangely emotionless reading experience. Fascinating in many ways, sure, but emotionless. As always, it’s hard to talk about my favourite part of The Uninvited without spoiling it. What I will say, though, is that in amongst the child violence and general apocalyptic trauma, there are some interesting human rights/humanitarian questions about how to deal with toddlers that are trying to kill adults on mass. Written out that way, I realise that it looks as though there’s going to be some clumsy and/or boring hypothesising by one or more of the characters but it’s actually quite well done. You have plenty of time to get used to the way Hesketh and Professor Whybray think and communicate so it doesn’t seem jarring when they start spouting biological or sociological theories about what is happening or how to deal with the fact that children have become more likely to turn on you with a nail gun or push you down the stairs than they are to do anything else. The ending was pretty much perfect and fitted so well with the rest of the story. When I was reading the final few pages, it actually occurred to me how nice it was to be reading stand-alone books for a while. Nice not to ‘turn’ the last page on my eReader and be filled with more questions than I had to start with. Well, actually, I did mull over this one for a little while after finishing, although instead of trying to plot out the next instalment, I was just pondering the final chapters. 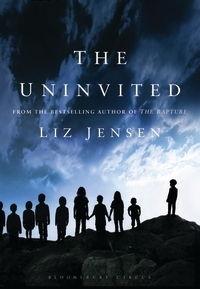 Overall: The Uninvited felt to me like the perfect blend of dystopian fiction and science fiction. A bit of a mixed bag but the intelligent pay-off worth the effort of paying attention through the dawdling early chapters. Recommended to anyone looking for a less melodramatic dystopian read (so much as there is such a thing!) who is happy with a little deferred gratification. Source: Received from the publisher via NetGalley – thank you Bloomsbury!